Knitted in Pure Cotton, the Jaipur has an asymetric, beaded neckline and lower edge and comes in 3 different sizes and 2 lengths. 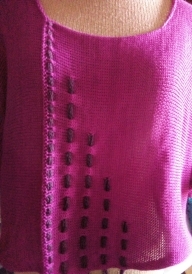 Similar to the Weave Jumper, but this style has several contrasted, beaded weaves. Available in 2 sizes & 2 lengths, the beads hang below the shorter length as on the left, or the longer, on the right, the beads finish above the length. 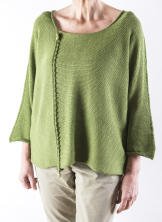 Knitted in Pure Cotton, it has 3/4 length sleeves and a round, open neckline. 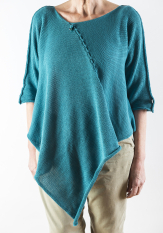 A Cross between a Jumper and a Poncho, this style has 3/4 sleeves and the diagonal seam has a beaded woven detail. Front and back both finish with the same pointed, poncho detail.